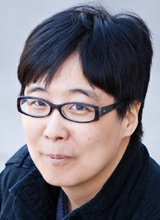 Lee Yoon-ha makes Hugo Award shortlists for 2nd consecutive year. August. 21, 2018 07:25. ashilla@donga.com. A Korean American novelist has made a bid to win the Hugo Award, a prestigious science and fantasy fictions award, for the second consecutive year, but fell short of receiving it. As Lee made the shortlist for the best novel award last year with his first novel “Ninefox Gambit” published in 2016, the Korean American was considered as a potential winner of this year’s Hugo Awards. But N.K. Jemisin’s “The Stone Sky” and other stories won the accolade in the final votes. The Hugo Awards are given in five different categories including novels and short stories. Each category winnows out six works for the shortlist and selects the final winner through fan votes. In the 65-year-long history of the Hugo Awards, Chinese author Liu Cixin remains the only Asian novelist to have enjoyed the honor with his novel “Three-body Trilogy” in 2015. Born in Houston in 1979, Lee was raised by doctor parents and spent his childhood travelling between the United States and South Korea. He decided to become a novelist in elementary school and continued to submit his works to publishing houses, before making his debut as a science fiction writer in his college freshman year, with his first short story published in the Magazine of Fantasy & Science Fiction.